The Heart Chakra teaches us that love can be unconditional. We can love someone regardless of whether or not they love us in return. The Heart Chakra is located at the center of the chest and, in addition to our physical heart, its energy permeates our lungs and our thymus gland. When the Heart Chakra is imbalanced, it can present itself as grief, bitterness, resentment, inability to forgive, depression, and unworthiness. On one end of the spectrum, a Heart Chakra imbalance can lead to compassion fatigue and depression. We care so deeply and so strongly about the suffering of others (or our own suffering) that we get lost in pain. The Heart Chakra teaches us that love can be unconditional. On the other end of the spectrum, we find indifference. We close ourselves off to suffering usually by numbing ourselves to ignore what is right in front of us. The lesson here is that we are not designed to avoid or to cling to the suffering we see. We are designed to see it, hold it with love, and then offer it up and let it go. We create Heart Chakra healing every time we choose expansion rather than contraction. During our yoga practice we activate this area through backbends that open the chest and contemplative practices that reintroduce us to our loving nature. 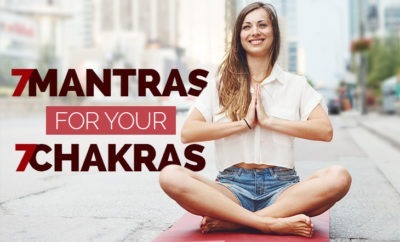 These practices include a hand gesture (mudra), a healing sound (mantra), a breathing technique (pranayama), and two yoga postures (asana) for greater balance and Heart Chakra healing. Anahatasana is named after the Heart Chakra, so it undoubtedly provides deep Heart Chakra healing. It activates a deep opening in the front of the chest. It also bring the heart above the head and feels much like a prostration and offering of oneself. While in the pose, press your knees and the tops of your feet into the earth to keep the muscles of your lower abdomen engaged and to refrain from collapsing in your lower back. 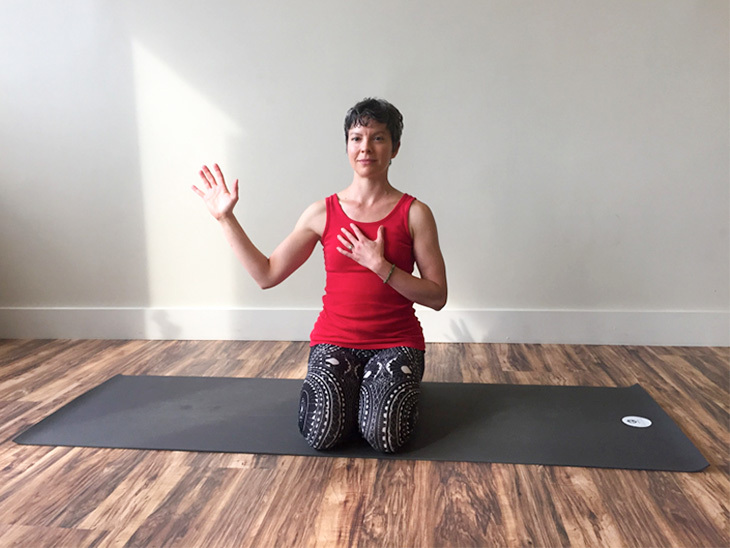 Bring your hands slightly wider than shoulder-width apart and lightly hug your shoulder blades in toward the middle of your back and down toward your hips. Anchor your head on a block if it cannot naturally touch the earth. Bring both hands to rest at the center of your chest and feel the rhythm of your heartbeat. Float one hand out and open to your side. Let it rest here for a breath, then return it to the center of your chest as you float the opposite hand away from your chest and out to the other side. Hold this position for a few breaths. The object of this breath-based meditation is to experience drawing something toward yourself at the same time as you let something else go. It is a tangible way to experience giving and receiving and to balance generosity with receptivity. 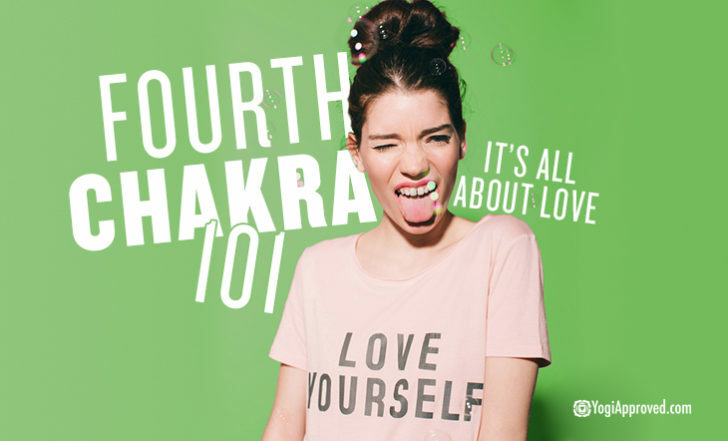 Repeat this motion for two to three minutes and then rest your hands on top of your Heart Chakra again. 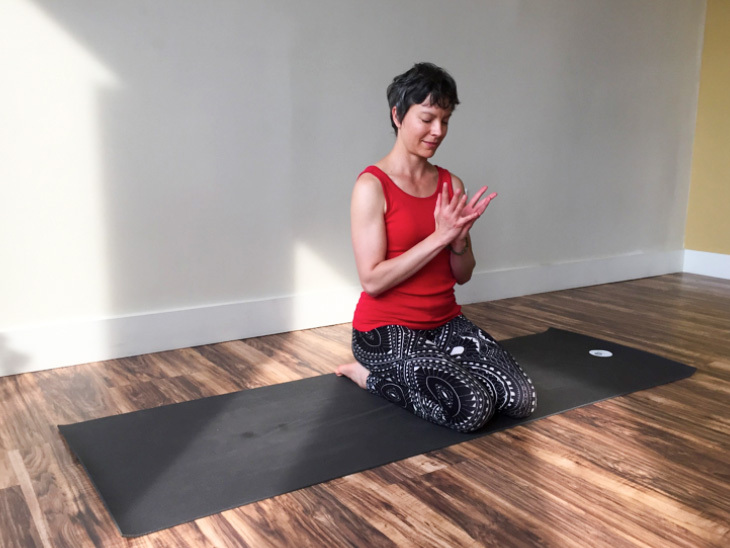 This mudra emulates the shape of the lotus flower – a beautiful image for contemplation. To form the mudra, bring your palms together to touch. Keep your wrists together as you expand your fingers like petals blooming outward from the center of a flower. Gaze down into the center of your hands. 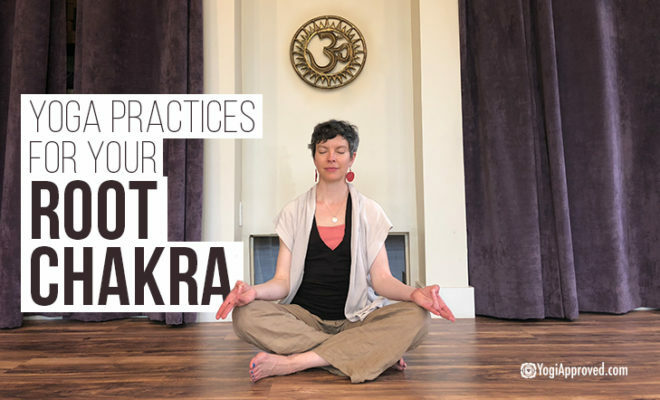 This mudra can be held for three to five minutes to increase a sense of contentment and gratitude. As you gaze into your palms, notice the beauty of their texture and color. You can also imagine the face of someone dear to you resting within your palms. As you imagine their face before you, you may silently repeat the phrase “thank you” as an offering of gratitude. This posture provides a gentle stretch to the front of your abdomen and chest. Your diaphragm experiences a passive release, helping to lengthen your breaths. 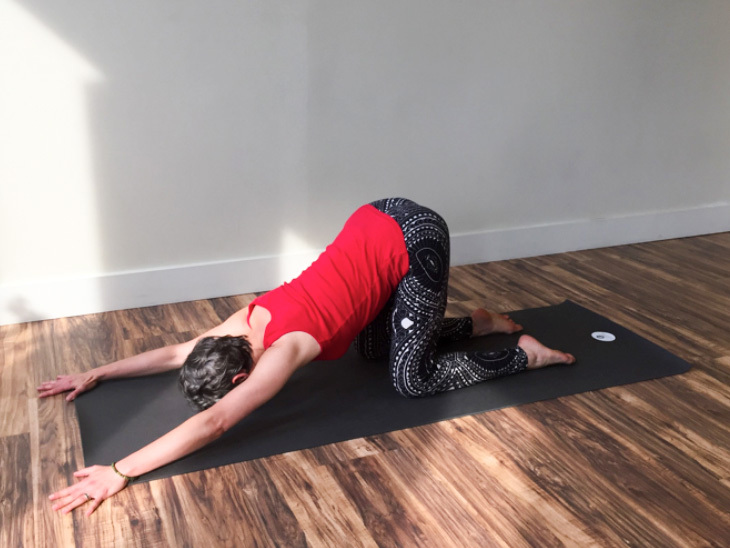 Hold the pose for three to five minutes, or as long as you continue to feel supported and comfortable in the shape. While in the pose, alter your normal breathing every fifth or sixth breath by taking a slightly exaggerated inhale that expands your belly, ribs, and chest broadly followed by a full emptying exhale. 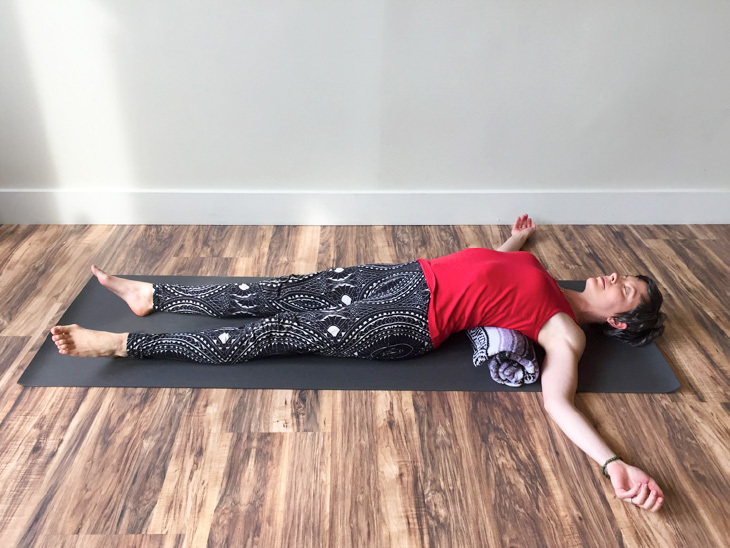 To come out of the pose bend your knees, elevate your hips and shift your shoulder blades further away from the blanket roll until your spine lays flat on the ground and the blanket roll is under your knees. Rest your hips on the earth here until your spine feels neutral, then roll to your side and return to a seated position. In addition to body positions and breathing techniques, yoga also gives us sound and vibration to work with imbalanced energy. The Heart Chakra vibrates with the sound “YAM” (pronounced YA-UHM). For the greatest Heart Chakra healing, chant this sound aloud while you focus your attention on the center of your chest. If you are in a public space, try chanting the mantra silently. You have everything you need inside of you – that is the ultimate teaching of yoga. The Heart Chakra correlates most strongly with the energy of air. The expansive energy of air wraps itself within and among all aspects of life – it does not discriminate. Bringing balance to the expansive energy found in your heart will deepen your appreciation for the life you have been given and the path on which you are walking. Use these simple practices for total Heart Chakra healing.